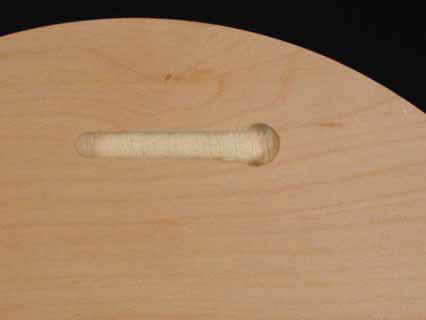 Art Boards™ Round Fine Art Panels have unique dovetail hanging slots for hanging round art. have unique dovetail hanging slots. Hanging Slots that are dovetailed into the back. Archival Round Fine Art Panels will hang flush on the wall without framing. This enables the artist or art collector to easily hang the circular fine art painting panel on the wall using a single screw or nail. Round paintings hang flush and snug to the wall. Without the need of picture wire or round framing. Round Fine Art Painting Panels are 3/4" thick and come in 9 stock sizes. Custom size round painting panels and round frames are available from Art Boards™ Archival Art Supply.